We start from scratch by creating a new Eclipse RCP 3.x application with one editor, that subclasses GraphicalEditorWithFlyoutPalette. At this point we’ll edit the plugin.xml to add the graphical editor. org.eclipse.gef to use GEF libraries. As dependencies are ready, we add a new editor extension in the Extensions. In the Extension Element Details we define basic property values, as in the image below. 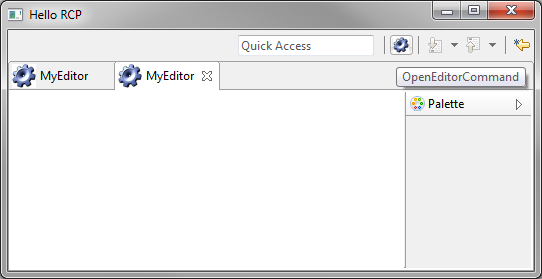 The id is the unique identifier for editor. We write my.rcp.gefeditor.editors.MyEditor and remember this id, since it will be used afterwards, to reference the editor. The class defines the java class implementing the editor. We write my.rcp.gefeditor.editors.MyEditor, and, by clicking on the class: Hyperlink we open the New Class Wizard to create “a concrete” implementation of the editor. In the Wizard, We change the proposed EditorPart superclas; instead we subclass the GraphicalEditorWithFlyoutPalette. To make the editor working, simply we put the editor Id, set the EditDomain and instantiate the PaletteRoot methods. Now, to see the editor on the application, we need to add a Command that opens it. For the command we take a note of the id : my.rcp.gefeditor.commands.OpenEditor, that will be used afterwards. Clicking on defaultHandler hyperlink opens a the New Class Wizard, to define the Handler Class corresponding to the command. To the new wizard window, we add a particular: our Handler extends the AbstractHandler class. In the handler class we simply create a temp file “define a tell Eclipse to open a new instance of editor, by passing the ID of the editor, that annotated before. Now we see the result, by launching an eclipse application from the Overview tab of the plugin.xml. The application looks like the image above, in which, you can see the button that opens the editor. Notice that the editor has a flyout palette on the right side. Moreover out application can open nore than one single file. EditPart: Controller that manage interactions. It receives notifications from the model, and is responsible for view updates. 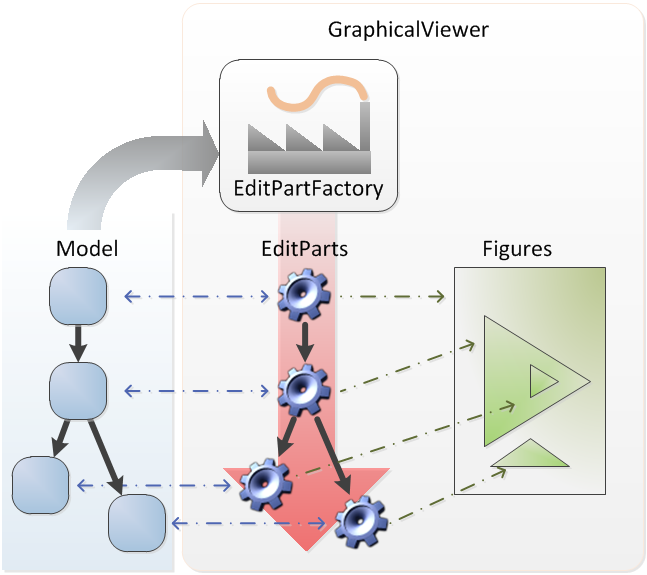 EditPartFactory: Object Factory that builds controller hierarchy. It is responsible to build a specific controller depending on the passed model instance. This factory helps with scalability and granularity. GraphicalViewer: Drawing Area on which the user interacts. This component is offertd by the framework and contains editor’s graphical elements. Given all presented elements, in the next section we build a basic block diagram editor. First we create a model object called MySchema. Then we write MySchemaFigure class, that is the View for the schema model. It extends the FreeFormLayer class, to allow containment of other object that we will use in next sections. Now we need a Controller for model. The GEF infrastructure implies a specific knowledge of the model. So we define an adequate constructor. Furthermore is expected that we provide a createFigure() method that instantiate the specific view. At this point is possibile to implement the EditPartFactory delegated to the construction of controllers hierarchy. This is used by the framework to build the whole infrastructure. by overriding the configureGraphicalViewer() method, that initializize the whole architecture. We launch the application to test what is happened. In the following figure we see a 1px border around the editor area; it tell us that our infrastructure is working, and we can proceed with next steps. Now, we have the architecture in place, and we would like to add block to the schema. The general architecture should looks like the following UML Class diagram. We have already many of components in place, but we need to add Block classes, and adjust some in other classes. First we add the MyBlock model class. It simply keep a reference to their dimensions. Then finally we define the MyBlockEditPart controller, that is constructed with an instance of the model, and can instantiate the specific view. Now, is fundamental to override the getModelChildren() for the parent MySchemaEditPart controller. This allows the controller hierarchy to be built. And finally we write a ContentProvider class, that buils a sample instance of the Schema. Now we launch the editor again and we can see how our sample looks like. EditParts Controllers have to receive notifications when the Model change. So we implement a notification infrastructure based on property-change-listeners, that make use of java.beans.PropertyChangeListener. The ElementModel, base class for models, can fire property changes. react to property changes, implementing the propertyChange() method. The implementation is required by PropertyChangeListener, and subclasses must implement this. Thus we need to transform MyBlock model, to extends the ElementModel. Consequently we Change the MyBlockEditPart controller, to extend the abstract ElementEditPart class. Note that the class requires the propertyChange(.) method. For the moment, we leave it empty. The property-change logic will be implemented in next section. We go to implement a simple action, that consists in changing constraints; that means changing dimension and position of a block. 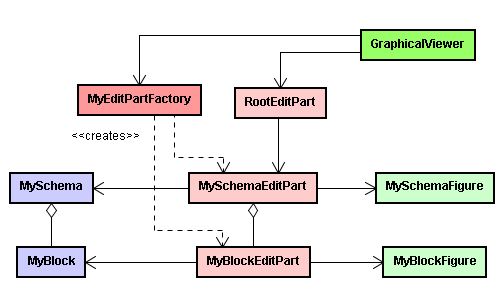 To make things working we need to hook the policy to the schema, by defining the MySchemaEditPart#createEditPolicies() method. At this point the editor is ready, and me miss only a notification from the model to controller. So we use the notification system seen before, in two steps. 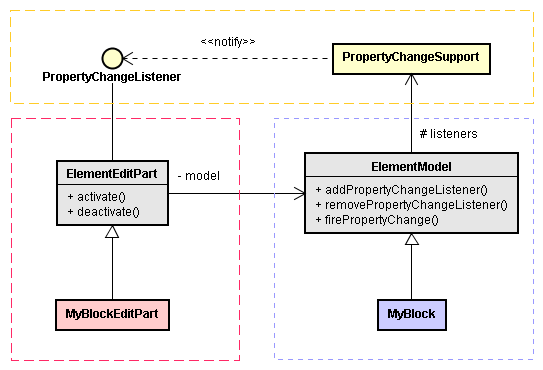 First we edit the MyBlock model class, by adding the call to firePropertyChange(). Then change MyBlockEditPart controller class, to react to the model change, by invoking the refreshVisuals() method, that repaints the component. Now we launch again the application, and we can test that now is possible to mode and resize blocks. The usage of the Command design pattern in GEF simplifies to make a simple implementation of undo /redo policies. In Eclipse any executed command passes inside a CommandStack that memorizes last executed actions, and allow an easy management of saving. The command stak is and application object that can be used even by more than one editor. The access of undo / redo operations is executed through predefined actions offererd by the framework. To activate such actions we use a component called ActionRegistry, that mantain in memory the list of executed Actions. Now we add the support to undo and redo actions. For this, we get the editor’s current instance of ActionRegistry and add register Undo and Redo actions. From plugin.xml select the editor node, write the name of our contributor class, then click on contributorClass hyperlink. This will opens a the new class wizard. Then we test again our application. Now we can see UNDO / REDO buttons on the toolbar. Testing the application we see that the undo / redo behaviour works. People tend to remember unfinished things better. This is the Zeigarnik effect. This tutorial is quite good to start with GEF, and if you want to go deeper, just take a look at the references and further readings. The zipped archive (88KB) contain a project without dependencies. 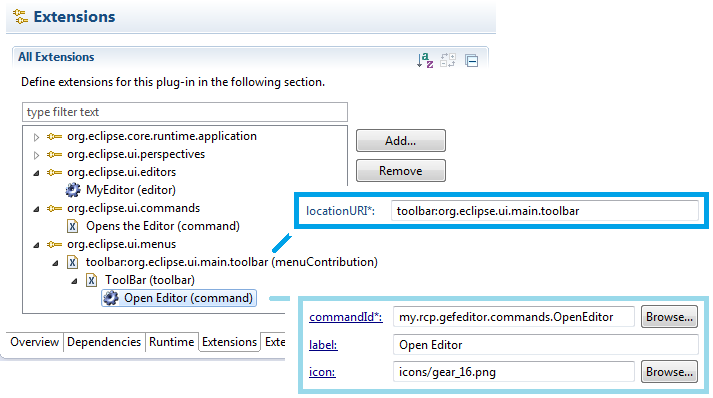 You only need to use Eclipse for RCP development added of GEF dependencies.